The origin of this story, which began life as a novel, even traces its source to a situation with dying. The conceiver of the story, Siobhan Dowd, was a terminal patient and passed away before she could write it. The novel was formulated and completed by Patrick Ness – who also wrote the screenplay for the film version. It is a very unusual type of fantasy, in which a monster is sprung from a tree, and visits a young boy whose mother is dying. It’s full of that grief, symbolism and the nature of our own reaction to the inevitable. It’s notable in its maturity, how all of the pieces in the narrative are scattered like a puzzle, and slowly put together to make a virtuous whole. It is also remarkably presented by an older veteran performer and a young actor making his major film debut, and they each bring a certain something to their characters that generate vulnerability and heroism. 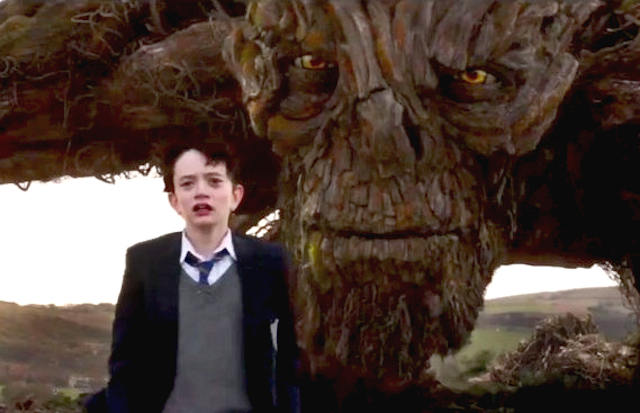 “A Monster Calls” is an original and remarkable journey. Conor (Lewis MacDougall) – described as not a boy, but not yet a man – is having a recurring dream, where a graveyard opens up and swallows his Mum (Felicity Jones). It is then learned that this parent is dying, and preparations are being made for his future, and its not necessarily in the British town where he lives. This involves his local Grandma (Sigourney Weaver) and his Dad (Toby Kebbell), who had years before moved to America. The pressure with his Mum and his situation calls up a demon, a tree Monster (voice of Liam Neeson) who appears at 12:07am on random days, there to tell Conor some stories. There are three tales the Monster will tell the boy, and there is one he expects in return. These are all designed to move Conor through his difficulties, but the Monster remains a mystery to unravel.